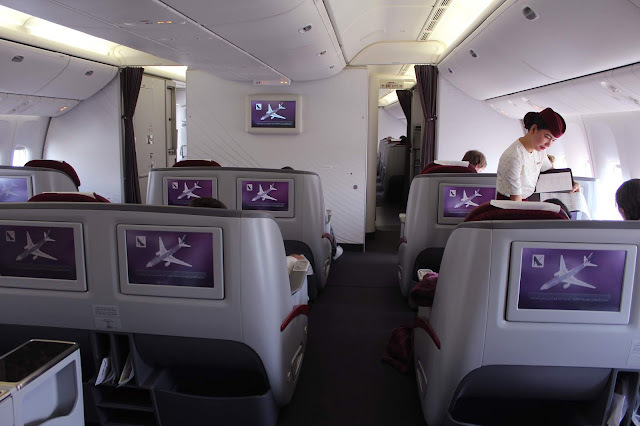 It had been more than a year since I had flown with Qatar Airways because of the blockade imposed on it by a few GCC countries. It meant that as I was a resident in the UAE, I could not fly them without going through Oman, but I discovered that they started flying from Sohar, just an hour into Oman. After a hop across the border and a short flight to Doha, I had a chance to see what the blockade had done to the fabulous new airport in Doha, easily the best in the region. What I find is an airport full of life and airport lounges buzzing. It is more than the World Cup. Qatar Airways and airport staff do their tasks as well as I have ever seen them done. Walking around the airport, I feel none of what the blockade had set out to achieve. Resilience. 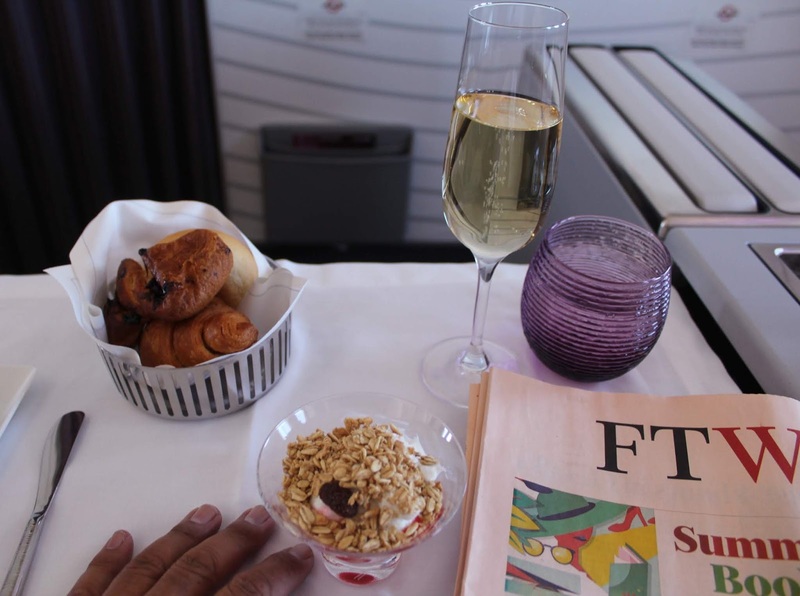 I decide to use some miles to upgrade my flight to Business Class for the next sector. Thankfully there is availability. Based on my fare, I am upgraded for a very generous 20 000 miles. Note that it is always worth checking about an hour and a half before a flight to see if there are upgrades available. My excitement is soon tempered though, when I discover that we will be taken by bus to the plane. This remains a sore point for me about the new airport. Nonetheless, I board the bus at 7.30am for my 8am flight to Johannesburg. The 777-300 ER, unlike the 787 that flies the route in off peak season, still has the old business class seat, but with a seating configuration of 2-2-2 and a seat that converts to a fully flat bed, it is still an impressive product. 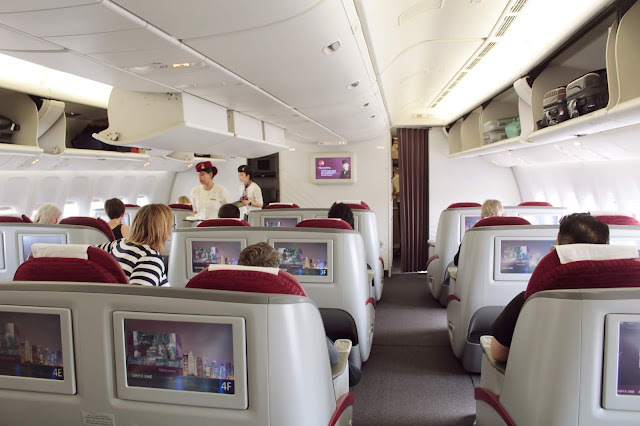 What I like about the cabin on this aircraft is that the business class cabin is divided into two, with 24 seats in the front and 18 just behind. 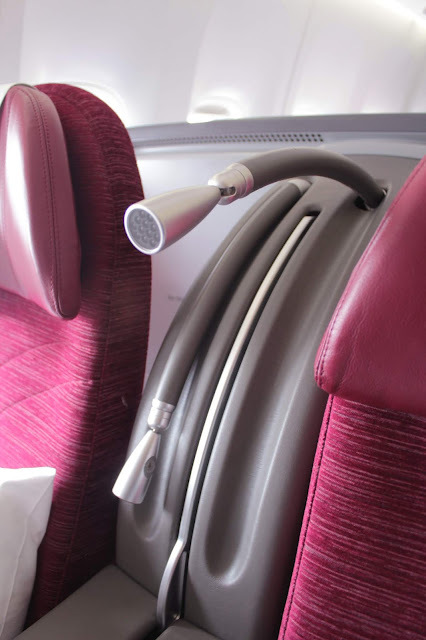 I really prefer this to certain aircraft where you have 48 uninterrupted seats. Intimacy. I forego my booked seat of 1E and opt for an unoccupied seat closer to the window, 1J. After nestling in, I am offered a drink and go for a glass of Drappier Brut Rosé de Saignée. It works nicely as an aperitif. When one is boarding the plane, something fresh strikes the right note. 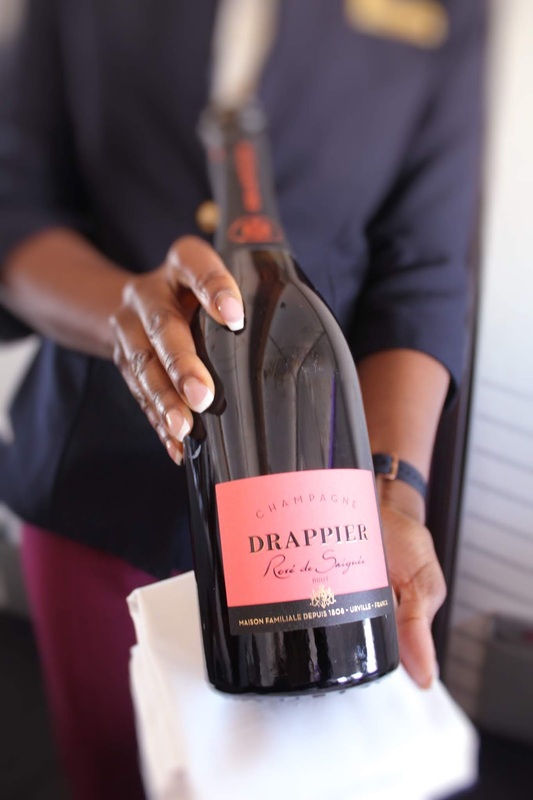 This 100% Pinot Noir champagne is one of few made the saignée method in which it is made as a by product of the red wine that is fermented. Fine bubbles and creamy mousse meet the eye and mouth, while notes of red fruits - raspberries, strawberries and cherry are followed by hints of citrus. A lovely crisp finish ensures that I have another before take off! Shortly before take off, my order is taken for breakfast. While there is a team of about 8 flight attendants taking care of around 26 passengers, I learn that Virginia will be with me most of the time. I think warm service is something that comes naturally to some people, and she is one of those. She is blessed with a smile that can thaw even the iciest of hearts of any a grumpy passenger. I also have the pleasure of meeting the Cabin director, Nitwaree, who makes her rounds greeting all the passengers. It is said a team is only as strong as its leader and this is evidenced here.Naturally, I find myself looking forward to the next 8 hours and 20 minutes. 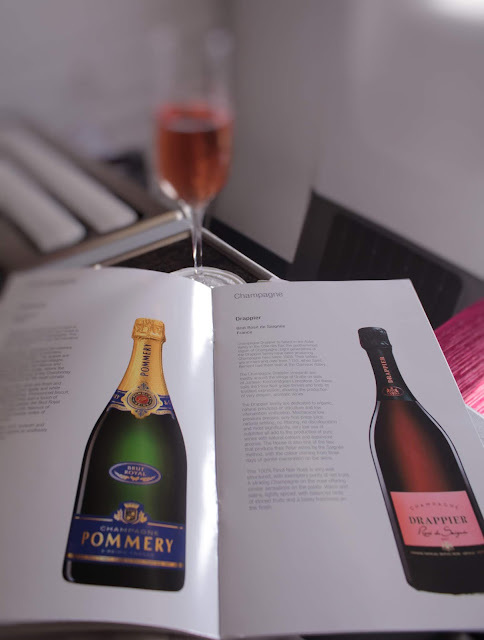 There is something rather decadent about a champagne breakfast and even more so when it is enjoyed at 38 000 feet, so to accompany my breakfast, I have a glass of Pommery Brut Royal champagne. On pouring, I notice it is pale gold in colour with mesmerising, hypnotic and lively bubbles. It is quite aromatic with apple and brioche quite arresting on the nose, while a taste reveals apple and lemon. I lap up the creamy finish. From a selection of starters that includes a Platter of Seasonal fruits, Choice of breakfast cereals and Assorted cold cuts, I start off with Greek yoghurt, strawberry compote and toasted granola with nuts. In a previous post about a premium experience on Qatar Airways, I commented on the gimmick of these 'chefs on board' and how I would rather see that money spent on training cabin crew how to plate and serve dishes; I find this more empowering for flight attendants. It is nice to see the airline continuing to go the route of showing its staff how to plate. I am impressed with how they do the dishes on board. 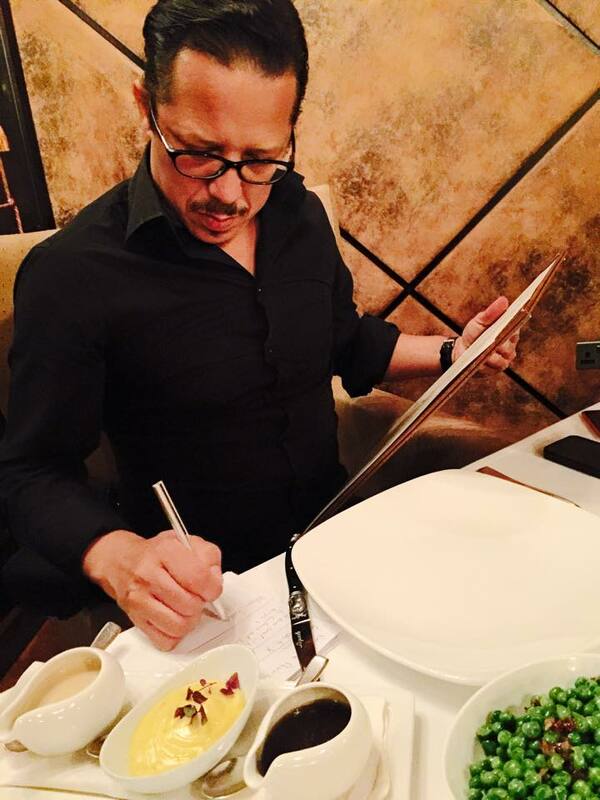 For my main course, I request the Traditional Arabic breakfast rather than the Emmental cheese omelette with chicken and herb patties as well as Steel-cut oats served with berries and cream. I am quite happy with my choice, with the foul medames especially flavoursome. Interestingly, you might want to have the Rosé bubbly with the feta cheese as it will cut through that saltiness rather well. I, on the other hand, am content with my Pommery. The service throughout is what you would expect from one of the world's best airlines and officially the highest ranked airline according to Skytrax. It is attentive but not overbearing and flight attendants are conversational but not chatty - all in all, a perfect balance. After breakfast, most of the window shades are drawn as some passengers get some shut eye. Because this is a day flight, there are no pyjamas and slippers, unlike the overnight flights when these amenities supplement the amenity kits specially packaged by Italian luggage brand BRIC’S and containing products courtesy of Italy’s Castello Monte Vibiano Vecchio, handed out to all. All in all, a more than adequate offering for an 8 hour and a bit flight. While I miss the fragrance that was included with the old Armani kits last year, I find the moisturiser does a fine hydrating job. After breakfast, I indulge in a short TV show before turning my attention to the wine list. I have a glass of Albert Bichot Pouilly-Fuisse 2015 from Burgundy. This crisp wine is quite a delight. Apricot, green apple and more than a hint of lemon makes my transition from the Pommery an effortless one. Feeling patriotic, I follow this up with the Swartland Chenin Blanc 2016 from South Africa. It is actually a lovely wine that can be enjoyed on its own or as aperitif. Peach and apricot stand out in the balanced wine that has a creamy finish. It seems logical to have the New Zealand Villa Maria Sauvignon Blanc 2016 from the Marlborough region. 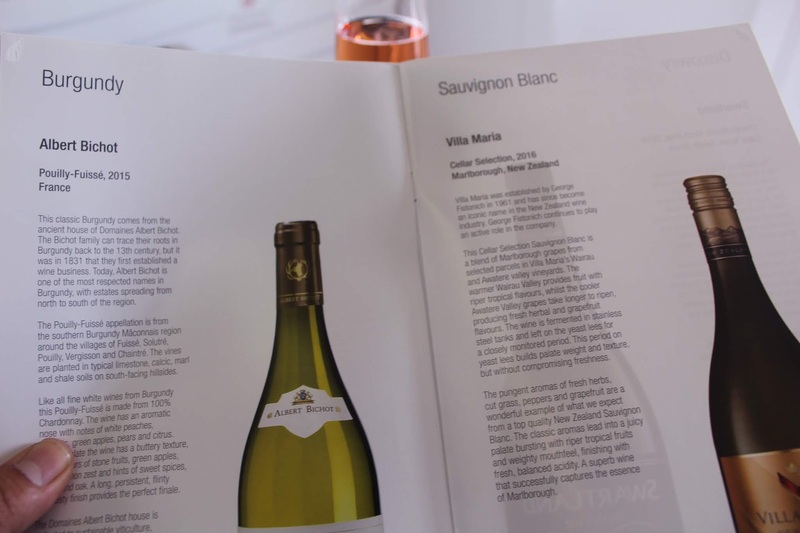 Now, I was often embarrassed to admit to wine aficionados that I enjoy New Zealand wines from the region but I have since become a lot more comfortable with admitting it. This wine has 'Summer' written all over it. Tropically fruity with grapefruit; fresh and crisp - all that is best of this region is in this bottle of wine. 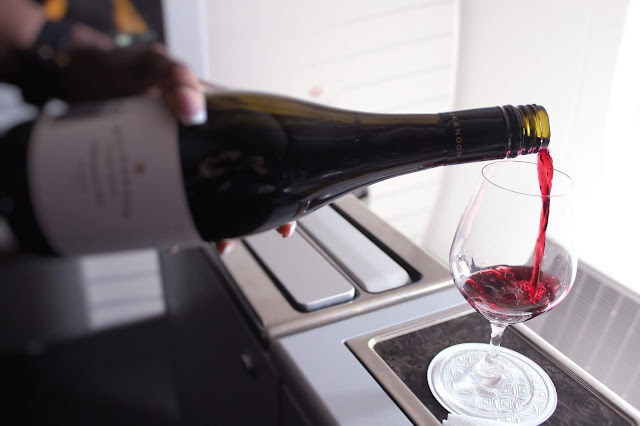 For a break from what I can only describe as a fabulous wine journey, I visit the galley and chat to the flight attendants. Let's face it. We mythologise flight attendants, don't we? I recall the film Catch Me if You Can where in one scene, flight attendants walk through the airport and every head turns to stare. My moment in the galley, as Meziel makes me an Old Fashioned serves to cast them as everyday people. 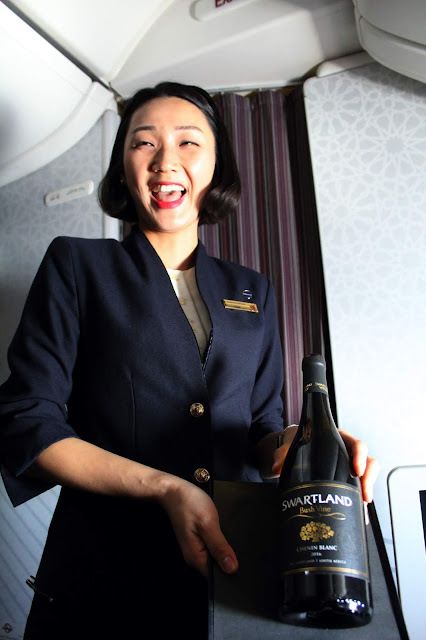 It is here where one realises just how normal flight attendants are. My talk to Kudakwashe and Averyl is especially enlightening as I ask them about how the blockade has affected them as flight attendants - they have adjusted and now is it is all about doing what is expected of them as professionals; pretty much business as usual. Resilient staff. My Old Fashioned meanwhile hits the spot; a good change from the wines. 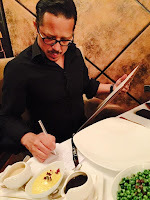 After dabbling in the whites, I switch my attention to the red wines.The wine menu has a range of red wines that will allow those who revel in reds with a lot of body to be in their element. 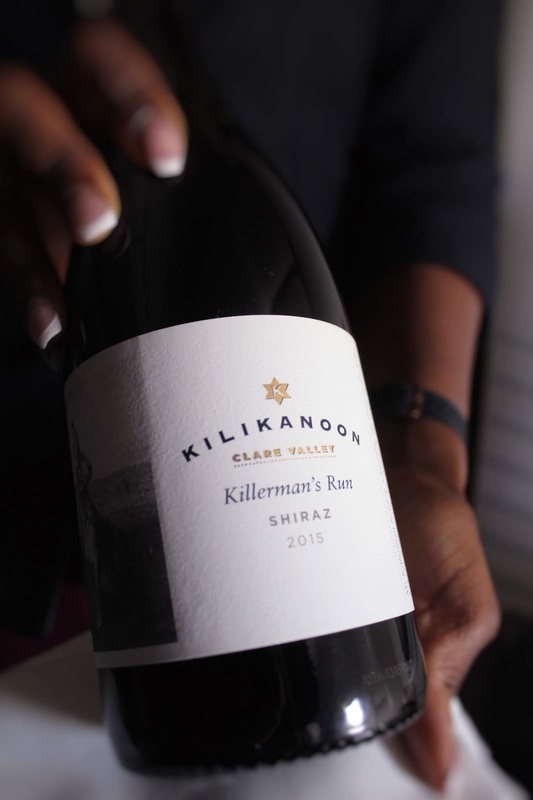 I start with a Kilikanoon Killerman's Run 2012, a Shiraz from Australia. Deep in colour and full of red berries, smokiness and sensuously velvety tannins. Mmmm. Next, the Terre del Grico Primitivo 2012, another full bodied wine from Italy, calls out to me and again; my expectations are met. This Mediterranean wine has some typical notes for such a full wine; plum, blackberry and dark cherry greet the palate. It is at these times that I wish my flight could be longer - much longer. Because it is a medium long haul flight, the main meal is complemented by Light snacks. 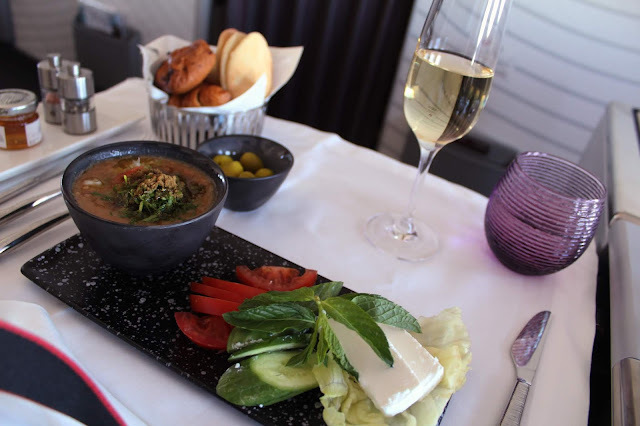 A Fresh garden salad, Chicken tikka masala with rice and even Afternoon tea are some of the options on board. 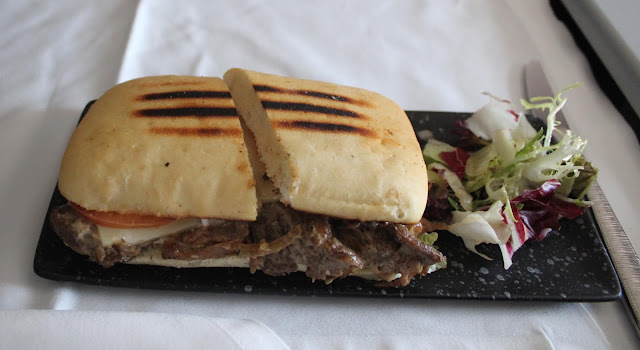 However, I choose the Steak sandwich, a chargrilled fillet of beef with melted Swiss cheese, caramelised onions and tomato on lightly toasted bread. 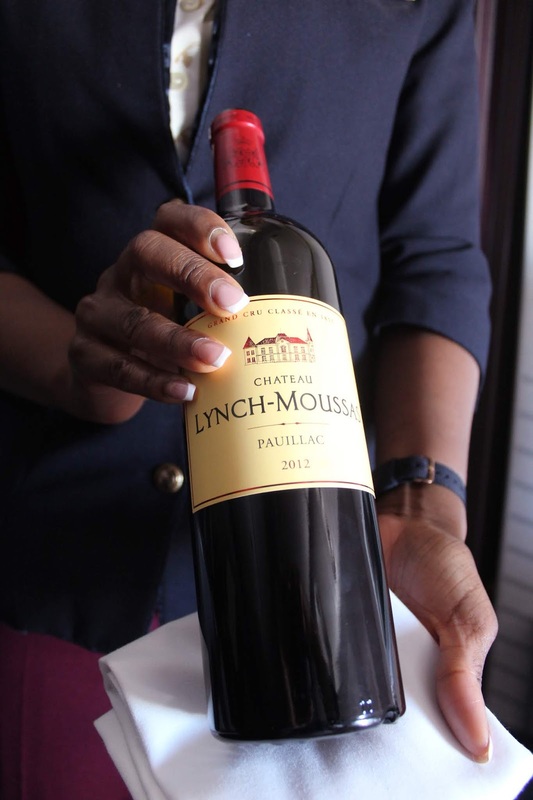 To drink, I have another full red wine that is available, the Chateau Lynch- Moussas Grand Cru Classe Paulliac 2012. This Bordeaux wine, with a 70-30 split between Cabernet Sauvignon and Merlot, has a sensuous ruby red colour, with typical black currant and plum notes. It is deep and intense with soft tannins. Hard not to love! The reds for me are a top draw, as I love full bodied wines for all their all round intensity and arrest of the senses. On the other hand, I imagine those who prefer softer reds may feel the distinct absence of a Pinot Noir or even a Sangiovese just to add variety of grapes. Nonetheless, for this palate, they could not have been any different. Of course, for the sake of this post, I try pretty much all the wines on board. I ensure that I stay hydrated though and drink as much water as possible. The latter is always the best way to fly. On this note, another thing I like about the flight attendants is how seamless the service is. Whether it is Cha, Midori or Virginia serving me water, they all know I am having the sparkling water. No mistakes are made. 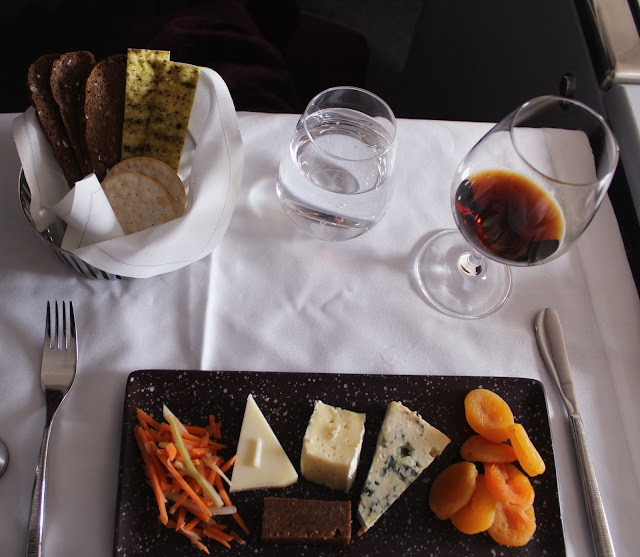 With about 90 minutes of my flight remaining, what better way to end this wine flight than with a cheese plate; Provolone, Pont-l'Eveque and Bleu d'Auvergne with some dried apricots and a delightful date paste. My dessert wine, Alvear Pedro Ximenez 1927 is simply sensational. It is indulgently sweet with piquant aromas of raisins, chocolate and caramel syrup. It cries beautifully with very lingering, long tears. Incidentally, this wine achieved a score of 96 from The Wine Enthusiast. Seriously, this is a fantastic pairing for the cheese plate. It is said that in life the journey is as wonderful as the destination. 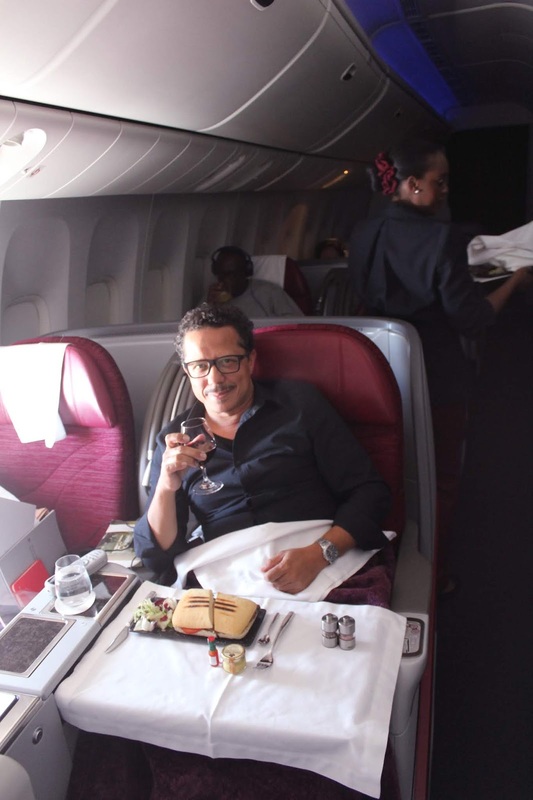 That is relative, but on this Qatar Airways flight to Johannesburg it certainly was true. 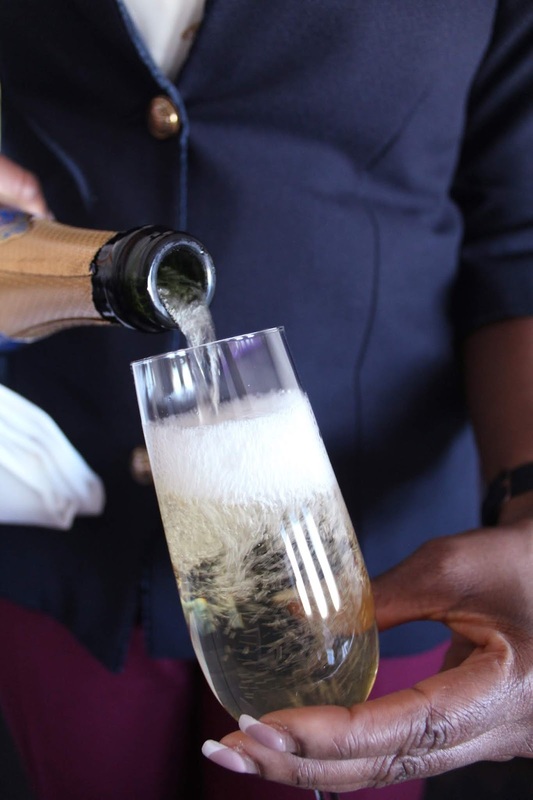 The airline offers a fabulous Beverage menu, with yours truly largely focussed on the champagne and wine served. 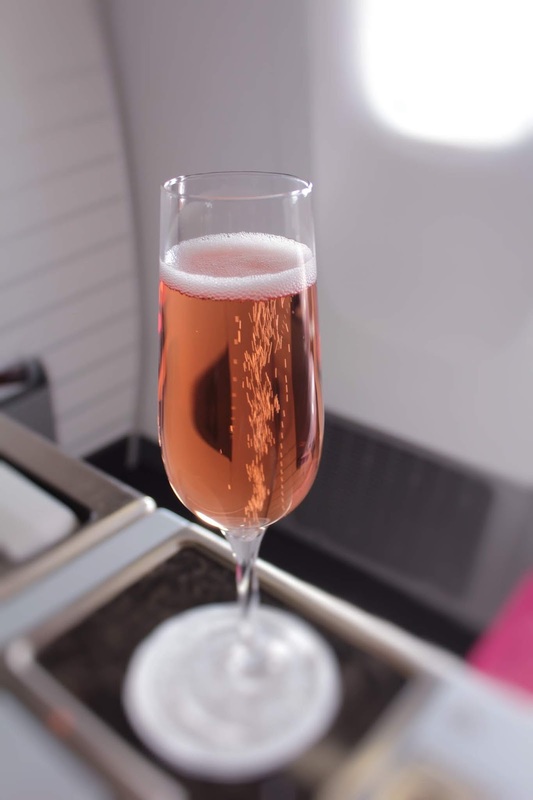 As good as the selection of champagne and wines were, it is the hands and hearts that served these that made a great flight even better. 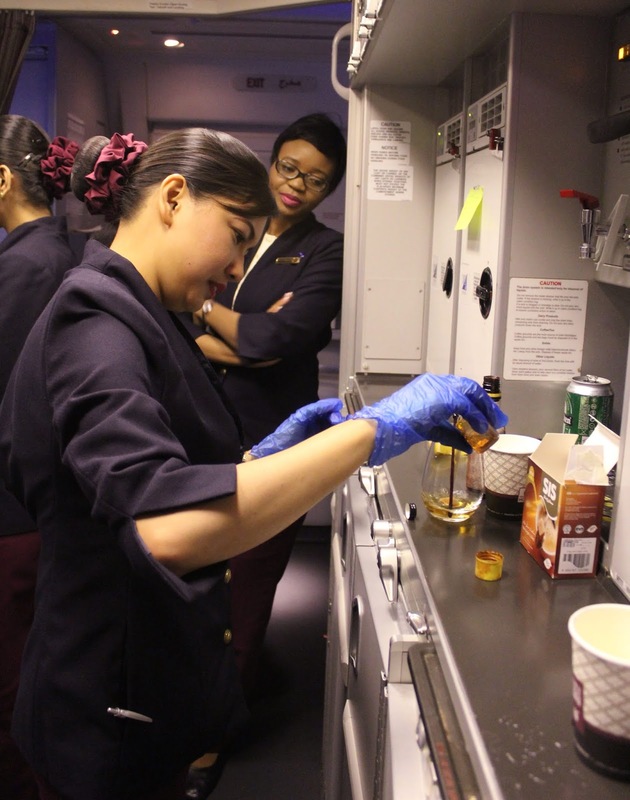 It is a deft balance between a good product and an airline's most valuable asset, its people. 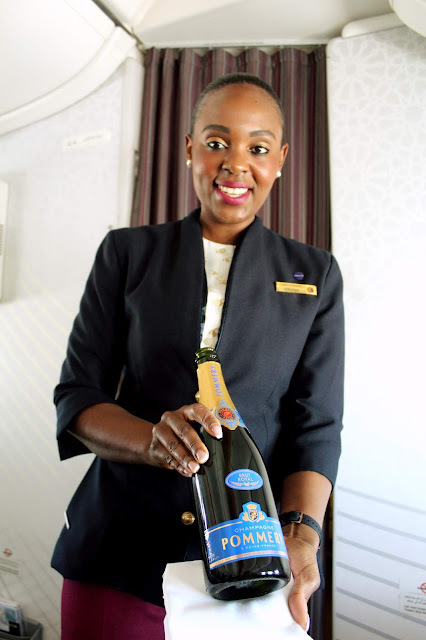 At a time when the airline is facing challenges because of an unfortunate blockade, the resilience of its staff, with the flight attendants a microcosm of that, is palpable. 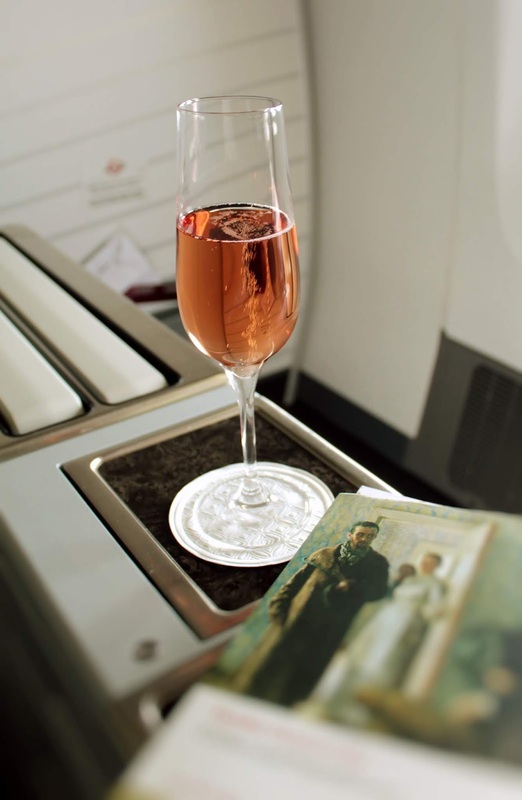 Wine lovers will appreciate the wine menu, especially those on longer haul flights. 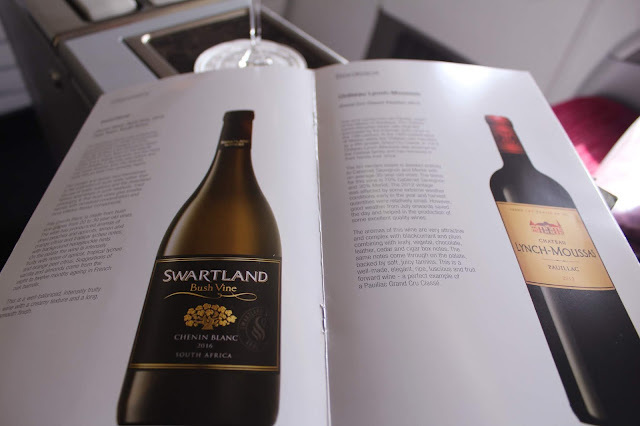 It is something like this wine offering that brings an added value experience to the flight. Coupled with the now familiar Qatar Airways flight attendants' service with emotion, it really is a great way to spend time in the sky. Qatar Airways flies double dailies to Johannesburg from its hub in Doha.